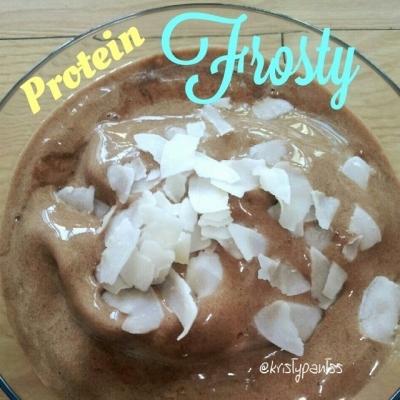 Ripped Recipes - Protein "Frosty"
Home » Recipes » Dessert » Protein "Frosty"
For the "frosty", place the following in your food processor; 1 medium frozen banana (or 1.5 smaller ones), 1/4 filtered water, 1tablespoon raw unsweetened cacao, 1tablespoon chocolate whey, 1/4 teaspoon xanthan gum- can probably omit but it really does thicken up the 'icecream'well!!! I get it on iherb.com (SIS866 gives you a discount on your first order!) Continuously pulse your food processor until combined! Serves 1. I added unsweetened coconut chips on top of mine. Enjoy!